Airstreamers are great customers. We like products that are specially made for our Airstream trailers and motorhomes, as well as service providers who understand our needs. 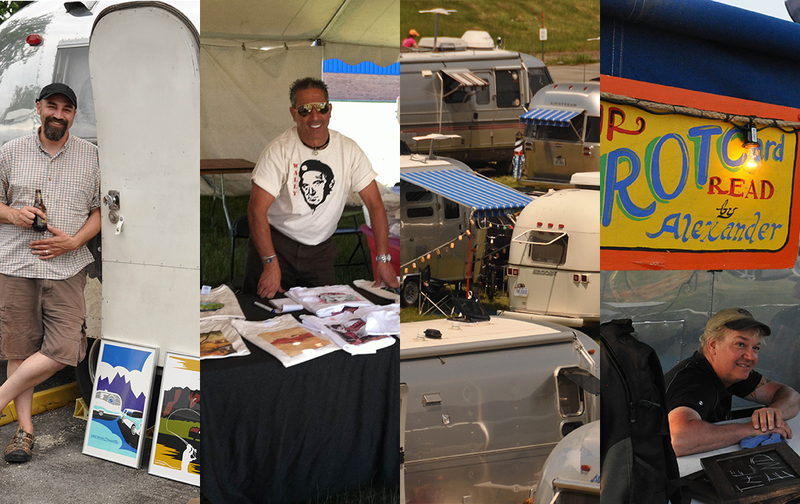 Repeat vendors have included Skymed (medical evacuation insurance), GEICO, Silver Trailer Jewelry, AirDrapes (custom made drapes and upholstery), Zip-Dee (RV awnings), Fantastic Vent, WBCCI (club), TechnoRV, Nuvite Chemical Compounds (aluminum polish) and Airstream dealers. We want you to participate! In our latest post-event survey, 100% of attendees said they’d recommend the event to a friend. But when asked what they’d like us to do to make the events even better, “more vendors” is the top request. Alumapalooza lasts 5 days, and most attendees camp on site, so there’s plenty of selling opportunity. Non-sales seminar opportunities are available to vendors who have a relevant topic, and sales seminars (listed on the official event program) are available to sponsors. Space for demonstrations is available upon request. Vendors are provided a 6 or 8 foot table space and 2 chairs. Depending on the venue for the event, space may be provided either under a tent, or in a conference space. The availability of electricity and space for hanging banners depend on the venue. Vendors are expected to register for the event, if they plan to attend other event activities or camp on site. Vendors who do not register for the event, pay $150 for a table space. Vendors must donate $300 in retail value of merchandise to the door prize drawing conducted during daily happy hours. Examples of merchandise includes t-shirts, tote bags, jewelry, camp chairs, polishing kits, or gift certificates. Discount coupons are not accepted as door prizes. Vendors will receive acknowledgment in our event guide and at happy hours during the door prize drawings. If you are interested in becoming an event sponsor, please contact us for more information. Event sponsors receive greater prominence in our event program and during the event. Event sponsors, for example, might be listed as sponsoring a particular activity (such as happy hour).